Tonight I wasn’t feeling very well an wanted something super light, yet still highly nutritious. I was glad when I saw my sister post this recipe to her Pinterest board. I’ve been seeing so many delicious recipes there lately! I’ve been doing a lot of these types of bowls because they are easy…and luckiy my entire family will eat them. 🙂 Eating healthy, whole foods does not have to be difficult! I started out by making the quinoa (2 cups water to 1 cup quinoa) with a veggie bouillon cube and I added a handful of diced sweet potato to it while it cooked. When it was done, I opened the lid and put a couple handfuls of fresh spinach in and put the lid back on with the burner off. After it steamed lightly for a few minutes, I put it all in bowls and topped it with herbed goat cheese and avocado. This could be customized so many ways! I would have added some shitakes if I had them, or maybe some cranberries. You could also leave out the boullion and top it with a yummy light dressing (Martha Stewart does a light vinaigrette in her original recipe). Have fun with it and then come back and tell me what you did! Heather’s Quinoa: I’ve had this on my “to make” list for a long time. It sounds (and looks) amazing! 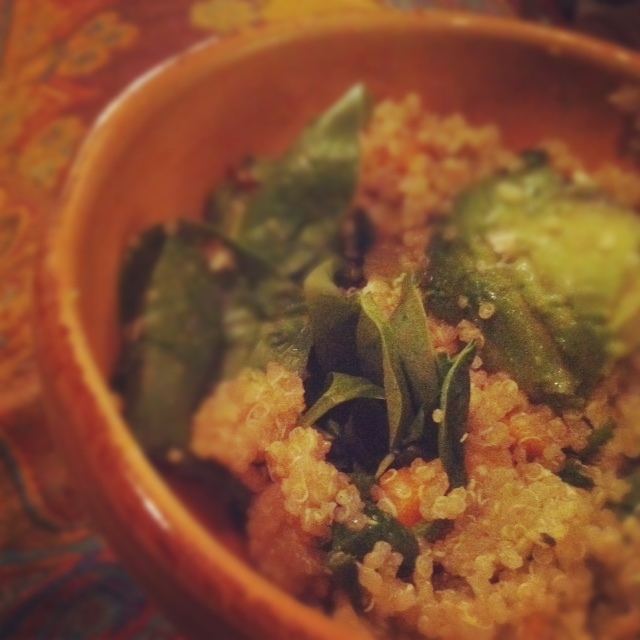 Quinoa and Black Beans: I used to get this at Wild Oats all the time…but as a cold salad. Great combination of flavors here. Delicious Big Bowl: The photo with this recipe gives you an idea of what I like to eat when I have cooked food. I do lots of quinoa with steamed veggies…topped with nama shoyu or lemon juice. Oh, and if you haven’t browsed around Heidi’s site yet, check it out because it’s GREAT! Raw Cream of Wheat: This is a recipe I posted last year…and it’s rather tasty and easily customized to your tastes! Quinoa (pronounced “keen-wah”) is one of my favorite foods. It’s so versatile and yummy…and it also has all of the essential amino acids our bodies need, which means it’s naturally a “complete protein”. And let me tell you….this recipe I am about to share will knock your socks off. I LOVE IT. I can’t get enough. Oh my. It’s so easy and can be used as the main dish or as a side dish. It’s also makes great leftovers…warmed up, eaten cold, or you could even top your salad with it! I love the flavor combination involved…the strength of the olives offset by the creamy goodness of the avocado. Mmmmmm mmmmmm. 🙂 The pine nuts give it just the right amount of crunch and the fresh herbs and lemon juice keep it tasting light and delicious. I chose to add some organic goat cheese to ours and it was perfect! You could also add some big chunks of artichoke hearts, I think they would work nicely as well. A tip…get the highest quality kalamata olives you can find, it’s worth it. I’m always amazed when people tell me they’ve never tried quinoa. And to that I say: “You’ve never felt the quinoa LOVE?? That’s nonsense”. So for those of you who are clueless when it comes to quinoa, this is a great dish to start with. Let me know what you think! Bring veggie broth to a boil and add quinoa. Cover with a tight lid and let it simmer for 15-20 minutes, or until it fluffs nicely with a fork. Remove from heat and set aside. Heat 1 T olive oil in a skillet over medium-low heat. Add pine nuts, shallots, and garlic. Saute util golden brown, about 8 minutes. Transfer quinoa to a large mixing bowl. Add the sauteed pine nuts, shallots, parsley, cilantro, and avocados. Add the juice of the 2 lemons for dressing. Sea salt and pepper to taste (I didn’t add any more salt because it was already quite salty from the olives and veggie broth…but do what you want!). 3/4 cup Qunioa (soaked/sprouted) Adjust for consistency. Combine quinoa, 1/2 of the banana, milk, and a pinch of salt in blender. Pour into bowl and mash in the other 1/2 of the banana. Add nuts, agave, and fruit. Quinoa (pronounced “keen-wah”) is a wonderfully perfect little “supergrain”. It’s a complete protein, so it’s great for vegetarians (and everyone else for that matter). Bella loves it plain. Here is a recipe from another one of my favorite cookbooks, “Vegan with a Vengeance” by Isa Chandra Moskowitz. This recipe is somewhat time consuming…but everything is from scratch, so that’s expected. Even if you don’t make the croquettes, the mushroom sauce is so delicious alone and would work great over pasta. You could get a little crazy and use shitake or portabella mushrooms as well. This dish is extemely filling and has a hearty flavor. Enjoy! Preheat the oven to 350 degrees. In a food processor, blend the black-eyed peas with the olive oil and soy sauce until just blended. Or use your hands to mush it for a truly messy experience. Add the quinoa and spices and combine the mixture. You should be able to mold them into balls that readily stick together. In a small bowl, mix together all the ingredients for the breading. Spray a baking pan with a little oil. Form the croquette s into walnut-sized balls. Gentlly roll the balls between your palms 3-4 times, then flatten out the ends so that the croquettes resemble marshmallows. Coat each ball with the bread crumbs and place on the baking sheet. When all the croquettes have been formed, spray lightly with oil. Bake for 40 minutes, turning once after 20 minutes. In a small bowl, whisk the broth and arrowroot powder until dissolved. Set aside. In a medium sauce pan, saute the onions and garlic in the olive oil for 3 minutes. Add the mushrooms, thyme, salt and pepper and cook for 5 minutes, stirring occasionally. Add the white wine and turn the heat up to high to bring to a boil for 3 minutes. Add the soy sauce and the broth/arrowroot mixture. Bring to a boil and then lower heat and simmer for 15 minutes, stirring occasionally. Add the nutritional yeast and whist until dissolved. Add the soy milk and whisk for another minute or so. Let cool for a few minutes before serving. 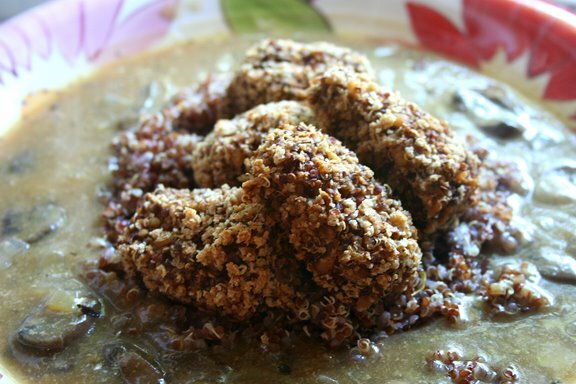 Serve this by putting the extra quinoa on the center of the plate, then put 4-5 croquettes on the quinoa and then add a nice helping of the mushroom sauce around the edges of the plate. Don’t pour sauce directly on the croquettes, as they will get too mushy. This website is not intended to give medical advice, but is for educational purposes only. You take full legal responsibility for any health decisions that you make. Please consult your physician or naturopath if you have medical concerns. Thank you. I will occasionally have affiliate links on this site. When you click on them and purchase (i.e. 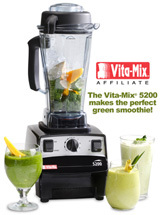 Vita-Mix)...I receive a small portion of that sale and it helps to keep this site going. Thank you for supporting my site!